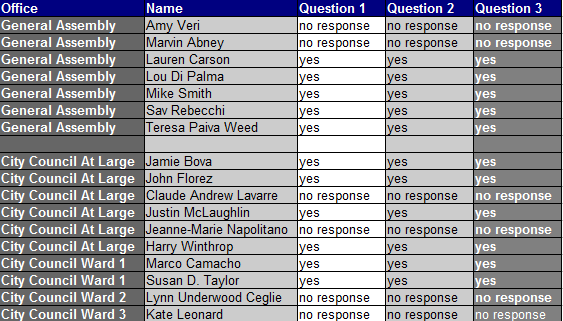 CCACG asked three questions focused on understanding each Newport candidate’s advocacy when it comes to expanding gambling and protecting a community’s right to decide. 1. Do you pledge to oppose any efforts to retain or expand gambling operations at Newport Grand if the Tiverton casino proposal is approved by State and Tiverton voters? 2. If the Tiverton casino proposal is rejected by Tiverton or State voters, do you pledge to oppose any efforts to expand gambling operations at Newport Grand? 3. Do you pledge to fight any proposal to amend the Rhode Island Constitution to remove the right of voters in a municipality to prevent the introduction of new forms of gambling into their community Citizens Concerned About Casino Gambling is comprised of supporters with a wide range of motivations. CCACG will continue its work to both inform and reform, including efforts to ask that any gambling revenue ABOVE current levels be applied to the state debt and gambling addiction services, and to not incur new dependency on more gambling revenue. We would also hope to request a plan to wean off of gambling revenue be adopted, as we must not feed our state’s growing addiction. This entry was posted in Uncategorized and tagged 2016, candidates, Casino, CCACG, election, newport by ChipLeakas. Bookmark the permalink.